the wide ring with outer rim carved as four truncated arms sweeping out from the broad central aperture, with three arms cut off abruptly at a shallow oblique angle, the fourth shorter arm ending in a bracket shape outline rising to a blunted point at the center, the thick convex sides tapering out to a rounded edge, the smoothly polished yellowish olive green stone with original russet brown inclusions and cloudy areas. The earliest jades of notched disc form have been found at Dawenkou culture (circa 4300-2300 B.C.) sites and many variations of the form have been documented in later Neolithic and early Bronze Age sites. The most typical examples are carved as flat discs with three arms. Examples with four arms are known, but they are relatively rare. Compare for example the notched disc with four truncated arms illustrated by Loehr, Ancient Chinese Jades from the Grenville L. Winthrop Collection in the Fogg Art Museum, Harvard University, Cambridge, 1975, p. 102, no. 105; and another example with four arms of more typical form, op. cit., p. 104, no. 107. Compare the very similar Neolithic jade notched disc of smaller size, in the collection of the Palace Museum, Beijing, illustrated in Gugong bowuyuan cangpin daxi: yuqi bian (Compendium of Collections in the Palace Museum: Jade), Vol. 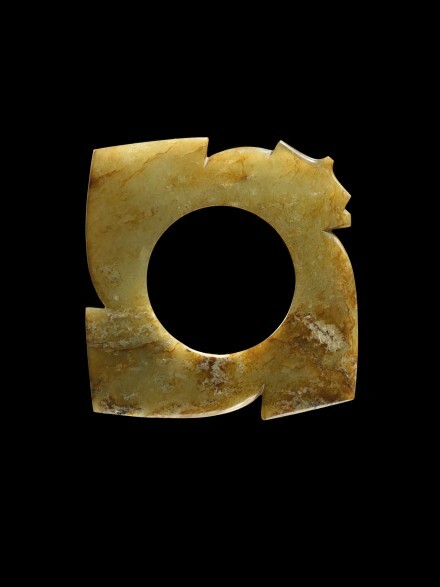 1, Neolithic Age, Beijing, 2011, p. 250, no. 251. Compare also the Neolithic jade notched disc with four truncated arms excavated from tomb no. 100 at a burial site in Qingliangsi, Ruicheng, Shanxi province, illustrated by Gu (ed.) in Zhongguo chutu yuqi quanji (Complete Collection of Jades Unearthed in China), Vol. 3, Shanxi, Beijing, 2005, p. 3, described as Second Phase of Miaodigou Culture (circa 3000-2500 B.C. ).